BBE's latest release is one you're going to love or not understand in the slightest. 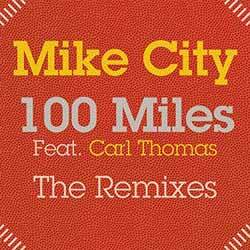 100 Miles: The Remixes presents eight very different takes on the '100 Miles' single from last year's (2017) The Feel Good Agenda: Vol.1 LP. Ricanstruction label founder and all-round soulful house legend Frankie Feliciano turns in a timeless, smooth remix of ‘100 Miles’, sure to be a summer classic for years to come. Generously, the New Yorker also supplies a treasure trove of alternate versions and DJ tools, including a sublime, beat-less ‘Keyapella’ and a must-have ‘Acapella’. The second remix comes courtesy of Colour and Pitch label founder and one half of BBE’s own Mega Jawns, Sumsuch. His warm and sultry deep house reworking of ‘100 Miles’ summons up summer terrace moods with airy piano and shimmering bells, while his ‘Voxtramental’ version reclines the sun- lounger even further. Yes, this is only going to appeal to those that enjoyed the original single, but I think you'll agree that each take is different and engaging in various ways.